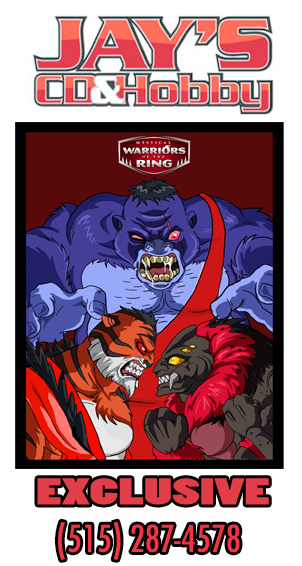 Visit the Ringside store for the latest in Mystical Warriors of the Ring Figures!! I would like to buy the newest small 4 pack of the Warriors of the ring set, however I and my husband are on a fixed income, and do not get paid until May 1st. Is there any way you would consider holding one set for us? I can pay after midnight april 30th, which will be may first. It’s the set that you have for $15 dollars, 3 small figures and one large. If you can’t or won’t, no worries. Just asking, as we love the first set and the wrestling ring. Thank you so much either way. I picked up an AWF mousepad/playset at C2E2 last year, and I really love it! I’m hoping I can pick up another one for my work desk? I don’t see it in your online store – but I hope it’s still a possibility! I want to say that the design of these mini figures is really good, you have done a great job ! I have a question : Is it possible to have a reissued pink flesh version of Goliath ? Jays CD and Hobby should have them in stock at least at the Southside Des Moines Store. Last I checked a month ago they were in one of the glass display cases. You can always buy them from our website http://mystwarriors.com/shop.htm or you can email us directly at fantasticplastictoys@gmail.com and we can take your order. Literally just discovered you guys 10 minutes ago and I am trying to find where to buy the playmat, but not finding on the site. I’d love to start collecting, and want to start off right. Will you please show me where I could buy one? Thanks in advance. Just got a 3 pack, and two of the weapon packs. Everything showed up timely and intact, and looks great with the original MUSCLE line and the new AWF ones, either way. The little briefcase opens, the trashcan lid comes off, and the tables break away, all like you would want them to. The weapons hold easily in MUSCLE hands (the fire extinguisher slips right onto the open hands perfectly). Just had to stop in and say thanks, and highly recommend to anyone curious. Hope to see news on how to get ahold of one the rings when they are back in stock!